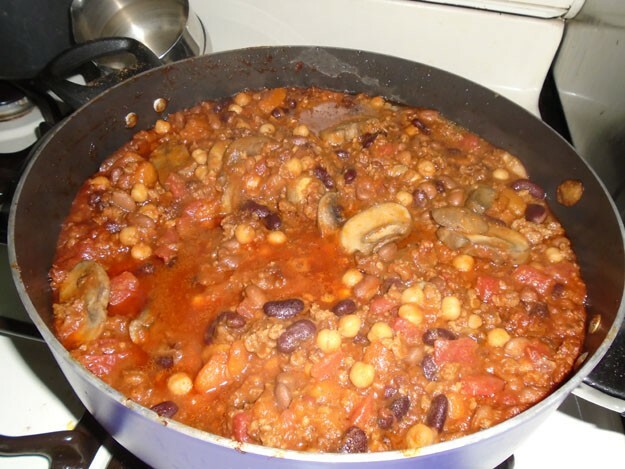 When I was working at Merck as a contractor may years ago, I came to like the Three Bean Butternut Squash Chili that they made in the cafeteria, which was vegetarian. 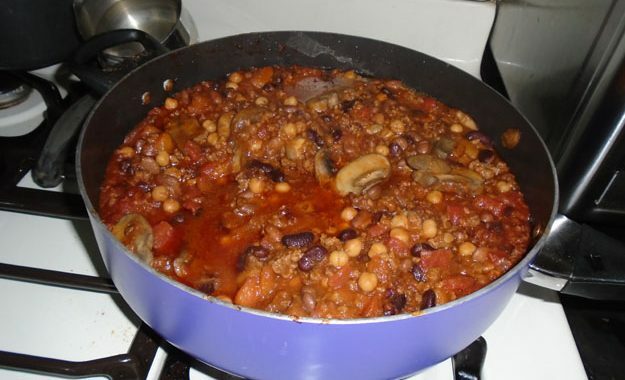 If I knew what day the cafeteria was going to have it on the menu, I wouldn’t pack a lunch that day and have the chili. 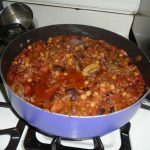 One day, I decided to start making it on my own and I decided that I was going to use meatless crumbles and three kinds of beans that I liked. At the time, I also like to dumped a lot of cheese in it, much to my younger brother’s delight (the more cheese the better). 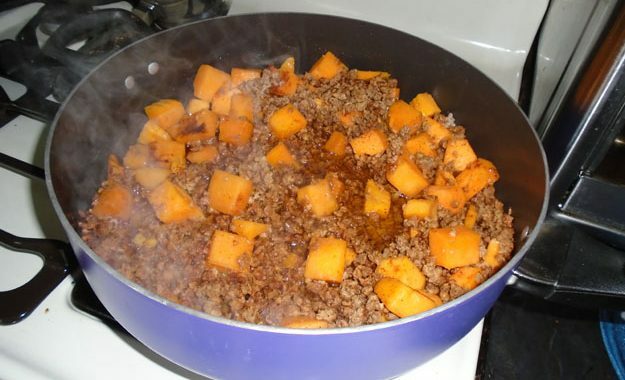 As of last summer, I modified the recipe to exclude the cheese and also, Gluten Free Veggie crumbles. Unfortunately, the two brands that I have used previously, Boca and Morning Star Farms, both contained Gluten. 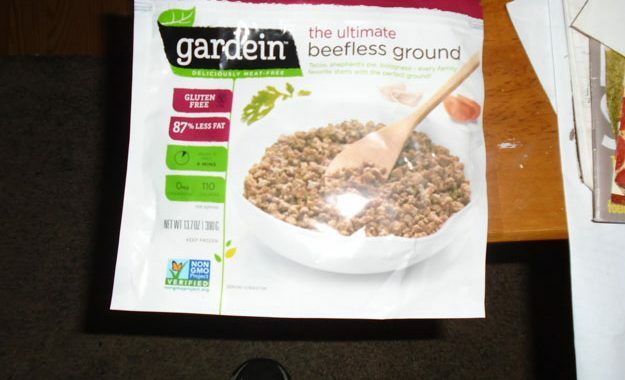 I discovered that the only brand that didn’t contain Gluten was Gardein, so I started using that. 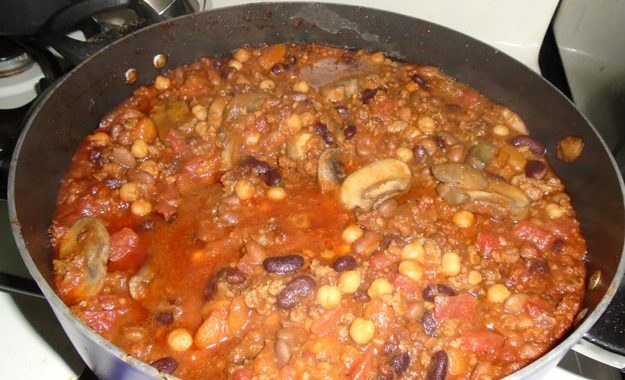 I also don’t miss the cheese either, not just because of my Dairy Allergy; the chili is less dense without the cheese and makes for easier cleanup because the melted cheese stuck to everything. Container of sliced mushrooms - 1 16 oz. 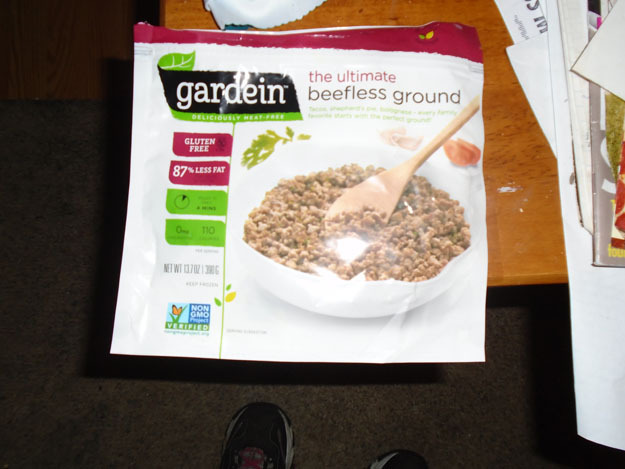 Can Garbanzo beans - 1 15.5 oz. 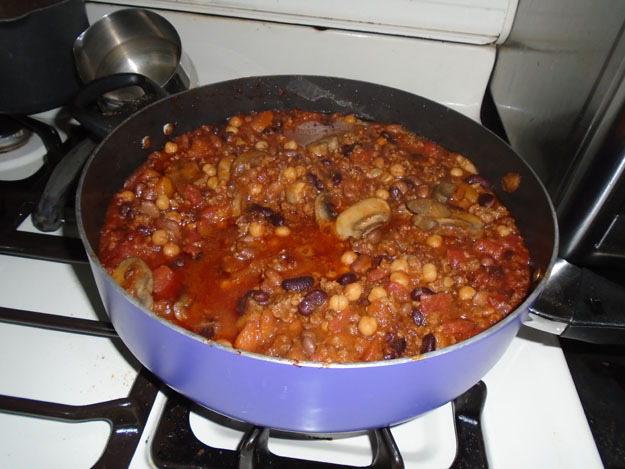 Can Kidney Beans - 1 15.5 oz. Can Pinto Beans - 1 15.5 oz. Can Diced tomatoes - 1 14.5 oz. Can Tomato Paste - 1 6 oz. In a 5 Quart saucepan, pour in one cup of olive oil. 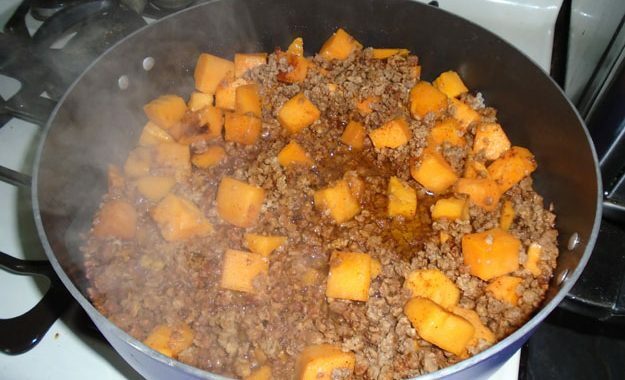 Add Butternut Squash and Beefless Grounds. Add Chili powder to taste. Cover and cook on medium-high heat for 30 minutes. 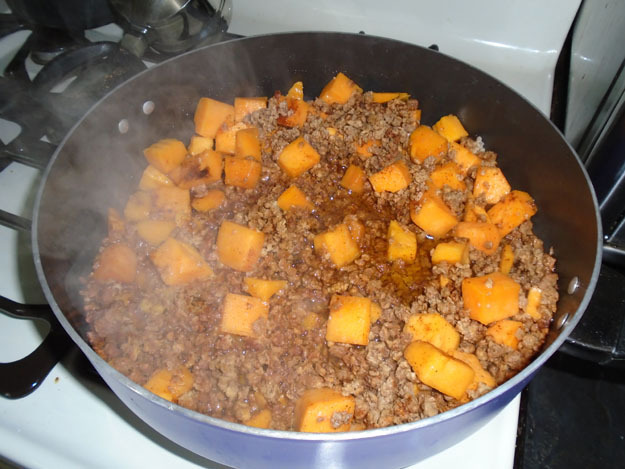 Uncover, stir squash and beefless grounds, then add sliced mushrooms. 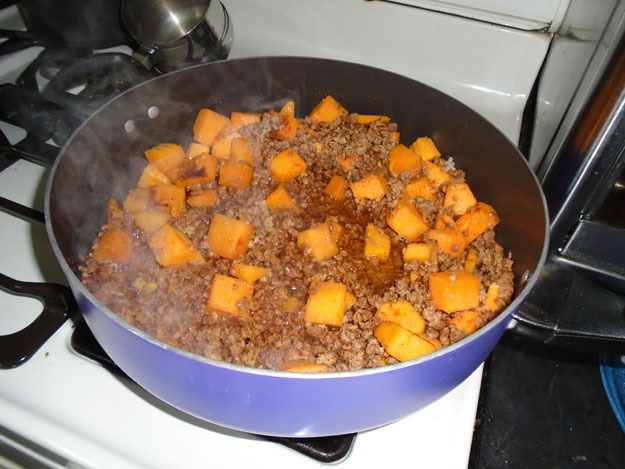 Cover again and allow to cook for another 30 minutes until squash and mushrooms are tender. Uncover and stir. Drain and add the beans one can at a time; stirring after each addition. Drain and add the can of Diced Tomatoes, be sure to conserve a little bit of the liquid and not drain can entirely. Mix in. Add can of Tomato Paste and mix thoroughly. Simmer on low heat for 60 minutes.